LONDON (Reuters) – Angelina Jolie might ooze Hollywood glamour, but if she’s armed and looking dangerous, the actress is not welcome in Britain. 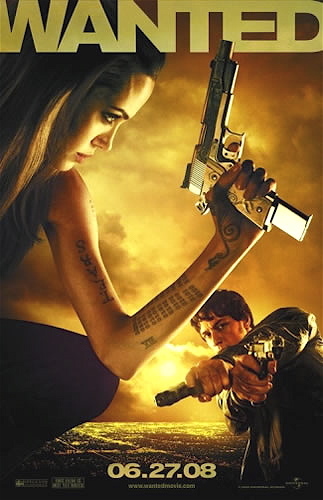 Britain’s media watchdog, the Advertising Standards Authority (ASA), has banned two posters of Jolie promoting the film “Wanted” after upholding complaints that the images of the gun-toting actress glamorized the use of guns and violence. One poster showed the actress crouching and holding a gun pointing upward while the other showed her lying on her back across a car’s hood, brandishing guns. The ASA said it had received 17 complaints from people who thought the ads were irresponsible because they glorify and glamorize gun crime at a time when there is increasing public concern in Britain about it. Some also complained that the posters for the high-tech action thriller co-starring James McAvoy and Morgan Freeman were unsuitable to be seen by children. “We considered, that because the ads featured a glamorous actress, action poses, several images of or related to guns and aspirational text, they could be seen to glamorize the use of guns and violence,” the ASA said in an online ruling. The film’s maker, Universal Pictures, defended the posters, saying the style of the advertisements reflected the film’s comic-book roots and providing examples of other ads they believed were more graphic and less stylized than their posters. Universal Pictures also said that the posters were not placed near schools and appeared in the London Underground system, which does not have a high proportion of children. But the ASA ruling, handed down Wednesday, seemed to come a bit late. Universal, owned by General Electric Co , said the posters for the film, which was released in Britain and the United States in June, were no longer being displayed, and there were no plans for their future use. Making millions from generating guns, conflict and violence as entertainment whilst showing compassion and concern for a person whose life has been turned upside down by guns and violence is just a little too weird.